Anti-human HtrA2/Omi mAb, clone 1B3, is derived from hybridization of mouse SP2/0 myeloma cells with spleen cells from BALB/c mice immunized with a recombinant human HtrA2/Omi protein. Can be stored at 4 degree C.
For long term storage, aliquot and store at -20 degree C.
Small volumes of anti-HtrA2/Omi antibody vial(s) may occasionally become entrapped in the seal of the product vial during shipment and storage. If necessary, briefly centrifuge the vial on a tabletop centrifuge to dislodge any liquid in the container`s cap. Certain products may require to ship with dry ice and additional dry ice fee may apply. Recommended starting dilution is 1:1,000. 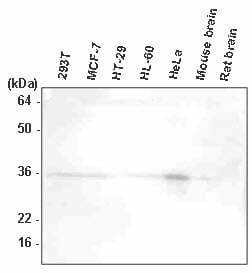 The extracts of 293T, MCF7, HT-29, HL-60, HeLa, mouse brain, and rat brain were resolved by SDS-PAGE, transferred to PVDF membrane and probed with anti-human HtrA2/Omi antibody (1:1,000). Proteins were visualized using a goat anti-mouse secondary antibody conjugated to HRP and an ECL detection system. NCBI/Uniprot data below describe general gene information for HtrA2/Omi. It may not necessarily be applicable to this product. 1. The important functions for HTRA2 in programmed cell death.